KATHMANDU, April 14: The constant sound of "peep-peep" from vehicles – which have become the hallmark of the capital city's unregulated hustle and bustle – will be tolerated no more by the government authorities starting Friday, the first day of the Nepali New Year. The decision, which was made public on April 3, aims to combat the Valley's deafening traffic noises. Many drivers and motorists blow horn during and after every maneuver and when stuck in traffic. Most of the honking from vehicles is said to be avoidable and has been contributing unnecessarily to the ever-growing noise pollution. The Department of Transport Management took the initiative, which has already been approved for implementation by various governmental departments, including the Department of Environment, Kathmandu Metropolitan City (KMC) and Metropolitan Traffic Police Department (MTPD). However, this does not mean that honking is completely banned as vehicles can blow horns during 'emergency situations'. Apart from that, drivers and motorists are allowed to honk at road turnings. "The main objective of the decision is to prevent unnecessary honking. Honks categorized as necessary, such as when used to avoid an accident and save life, are still allowed," informed Hari Bahadur Kunwar, chief of the administrative department at the KMC. All the vehicles that operate in the Kathmandu Valley will have to abide by the rule. However, the ban will not be applicable to ambulances, police vans and fire engines, according to KMC. KMC and MTPD have been creating awareness regarding 'No Horn Please' rule through posters and boards, which can be found at almost every section of the Valley's roads, well noticeable to the motorists. The extensive awareness campaign has been aided by social media like Facebook and Twitter, as well as news agencies. 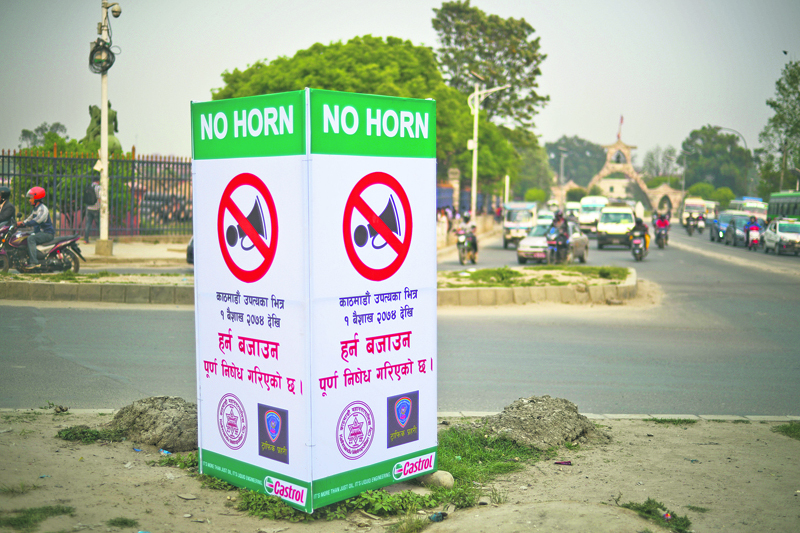 Traffic police will oversee its implementation and take action against unnecessary use of horn. Anyone caught tooting unnecessarily risks being fined up to Rs 5,000, informed Superintendent of Police Lokendra Malla, spokesperson for MTPD. However, the decision has garnered mixed reactions from the public. Samir Shrestha, a local of Chabahil, welcomed the move saying it is a huge respite to the pedestrians who have to walk along busy road stretches. "Many a time, vehicle horns are so loud and constant that we cannot hear a companion walking with us even when they are screaming. Unnecessary honking should be discouraged and this is a very good initiative of the government no matter how effective the implementation will be," he added. On the other hand, Dawa Lama, a local of Gairigaun doubted whether the rule will be implemented effectively. A frequent bike rider, he said, "I don't think people will obey the rule, not for long anyway. Pedestrians cross the roads haphazardly, preferring not to use zebra crossings and sky bridges even when they are nearby. This compels motorists to blow horns. Even the existing zebra crossings have faded and are hardly visible, creating problems for the pedestrians who are willing to obey the traffic rules." He suggested that the rule could be better implemented if traffics are managed properly in the Valley's roads. "Traffic systems should be strengthened by repairing bad roads and defunct traffic lights. We don't have to use horns frequently when road traffic is well-managed." The government had previously discouraged the use of horns nearby schools and hospitals. However, the policy was hardly enforced. If not enforced and monitored properly, those who have praised the 'no horn' rule are likely to be disappointed soon.